I was raised by a woman who chronically rearranged furniture. It was a nervous habit. Coming home late you had to look for a particular end-table that got put in odd places, usually just in front of your shin. Then a week later, in front of your other shin. I had spent my life trying to not-like-my-mother, but there I was shuffling chapters around like a veneer end-table, a green Naugahyde sofa, and an orange and brown zig-zag afghan. How the mighty had fallen. After a whole year of typing away on my manuscript for Stable Relation in predawn hours, I’d lost perspective. I had 80,000 words but I had no idea if they made any sense. I’d tried so hard to write in a way that did not draw conclusions, that didn’t tell the reader what to think, that I couldn’t tell what I thought. I had an idea of how I wanted to tell the story when I started. I wanted the first chapters to feel rushed and a bit uncomfortable. Then that feeling would give way to an eventual sense of gratitude and ease. I wanted the writing style to reflect the story line as it progressed. I told the story in an episodic way, more than chronologically because I like stories that circle back on themselves. In hindsight, a more linear approach might have been easier but I wanted the story to unfold like we meet people; who they are gets defined by their experience but we only learn that over time, in bits and pieces. My developmental edit hadn’t been what I expected …as if I’d written enough books to know. 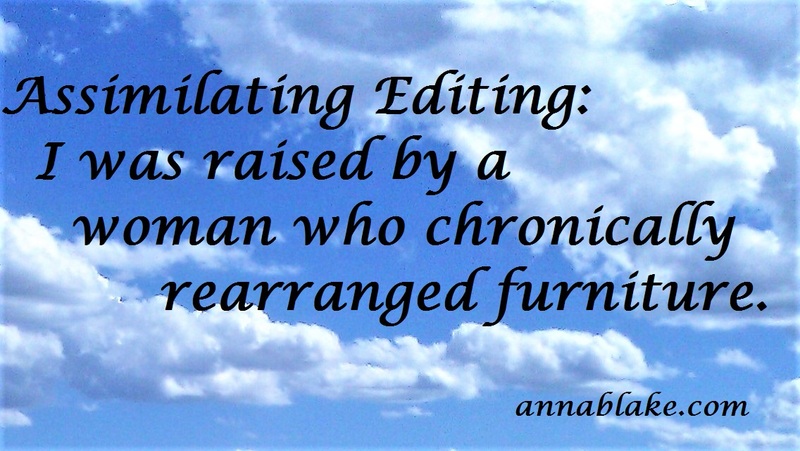 After the best rewrite (rearrange) I could do, I sent the manuscript to a second professional editor for line editing. It cost real money like the first editor, but my reasoning was that if I wasn’t willing to invest, why should a reader? I knew that a publisher would edit the book if they picked it up, but I wanted my version so tight that perhaps they’d let it be. I consulted the Editorial Freelancers Association and found three possible editors, interviewed, decided, and sent the manuscript off again. My manuscript came back, digital this time, with red ink track changes in the margins. Who knew word tense was such a challenging thing? I made the same grammatical errors repeatedly but correcting them a few dozen times does drill the lesson. There were times the notes in the margin told me I was redundant and other times that I was preaching (no surprise). The edit was impersonal but at the same time, I felt she cared profoundly about my grammar and sentence structure. This edit was a lesson in how to write as well as a keen focus on the lumps and holes in the story. It transformed my ability to write a sentence, in this manuscript and going forward, and I joyously paid her fee. I had no idea if she liked the actual story; she was objective. Then near the last chapter, in a red track change, one word: [crying]. Through the editing, I had come to respect her abilities; I didn’t know until that last moment how much I wanted her to like Stable Relation. I reworked the book with those edits but it was more like moving knick-knacks instead of entire sofas. Word by word, my confidence meandered back. I sharpened my points and got all my ideas on the same page; irony and humor returned. I said more with less and in the right tense. When the time was right, I sent the manuscript to a third editor for a final proofreading edit. A few weeks later the manuscript came back, this time with fewer red track changes than ever, mostly grammatical, some capital letter mistakes with job titles. (The humans in my book had job titles; only the animals had names.) There were a few more word mistakes, like using one instead of on, one every other page or so, that my eyes had missed. In the process of making changes from the last edit, I had written new prose in a few places with imperfect skill. Editors are magnificent. This Week: You’re a writer. You write. Words are your minions. They await your bidding with energy and a good ground covering gait. Miles of words pass through your fingers. After all the emotional and technical challenges of writing, you remember how much you love to tell a story. Your assignment this week is to consider an old Akira Kurosawa movie called Rashomon. Tell the same scene from more than one perspective. Or write a story that tells something important in hindsight. Alter your voice in prose: Use sentence structure to help define the emotional aspects of your scene. Have a written plan for an essay and then stick to it; think fascinating introduction, the arc of the story with plot twists, and really stretch for an unexpected ending. Or for the fun of it, write a bit of nonsense with wrong words spelled correctly, in that one and on sort of way. Pick one of these ideas, or make one up that interests you, and just start. And then let us know on our Writing Herd Facebook page. It doesn’t matter where you are in these assignments. Some new members have joined; say hello! If you are a founding member but have not shared your thoughts yet, chime in, whether it’s sharing a piece you’ve written or your thoughts about writing in general. We’d love to hear from you. Let us know how it’s going; let’s use each other for encouragement and talk about how we write and well as what we write. Most of all, Write on! That final editor called me just before returning my digital manuscript. It was a Saturday morning and I was giving a riding lesson. I usually don’t answer my phone while teaching, but I will check caller ID to check if it’s a client. Seeing my editor’s name, I apologized to my rider and took the call. I listened as my editor said it was the best book she’d every edited. Then she said some other things. I forget what happened the rest of that day.